Lois L. Brownsberger, age 95, of Clinton, passed away Thursday, September 27, 2018 at Truman Lake Manor, Lowry City, MO. Lois was born September 15, 1923 to Archie L. and Lura ‘Piepmeier’ Muchmore of Appleton, City, MO. After high school she attended Central Missouri State College, now University of Central Missouri, where she received her Bachelor’s Degree in Education. Lois married Joseph Henry Brownsberger on March 8, 1945 in New York City, New York while Joe was in the Navy during WWII. In 1946, they returned to Appleton City where together they owned and operated a retail clothing business for many years. 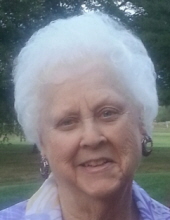 Lois was a member of the Appleton City P.E.O and the Appleton City Community Club where she and Joe worked hand in hand to greatly benefit the Appleton City community. Except for college and the time that Joe was in the Navy, Lois lived her entire life in Appleton City until moving to Clinton in 2005 where she was a member of Holy Rosary Catholic Church and the Lorna Kemper Club. Lois and Joe enjoyed traveling in their motorhome during retirement. Lois especially enjoyed her home, both in Appleton City and after moving to Clinton, and was very proud of being married for 65 years before Joe’s passing in 2010. Survivors include a son, Michael (Gail) Brownsberger of Monett, MO; two daughters, Donna (David) Zajonc of Bainbridge Island, Washington and Diane (Ed) Hannah of Clinton, MO; nine grandchildren, Chris, Kelly & Amanda, Lindsey & Ben, McKenzie & Billy, Morgan, Carson, Eric, Mark and Evan; several great-grandchildren, nieces, nephews, other family and friends. Lois was preceded in death by her parents, her husband, and a brother, C.E. Muchmore. A Rosary Service will be conducted at 6:30 PM on Monday, October 1, 2018 at Consalus Funeral Home, with visitation to follow until 8:00 PM. A Funeral Mass will be at 10:00 AM on Tuesday, October 2, 2018 at Holy Rosary Catholic Church. Interment will follow at Appleton City Cemetery, Appleton City, MO. The family has requested that memorial contributions be made to either Twin Lakes Hospice or Holy Rosary Catholic Church and left in care of Consalus Funeral Home, 209 S. 2nd St., Clinton, MO 64735. To send flowers or a remembrance gift to the family of Lois Brownsberger, please visit our Tribute Store. A Rosary will be said for Mrs. Brownsberger at 6:30 PM at Consalus Funeral Home, a visitation will continue until 8:00 PM. "Email Address" would like to share the life celebration of Lois Brownsberger. Click on the "link" to go to share a favorite memory or leave a condolence message for the family.